Of all the disgusting things I’ve seen and heard during the campaign on 8, this, which I purloined from thechaserblog, absolutely takes the cake. 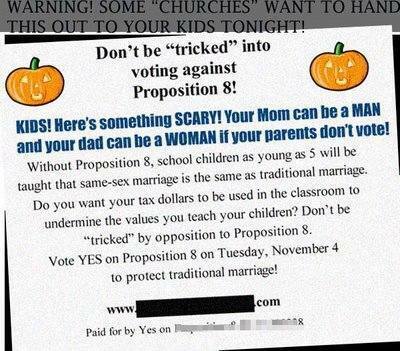 Apparently some churches in California have given these cards to parishioners and asked them to hand the cards out to children, along with the candy, on Halloween night. Doesn’t that just turn your stomach?